Gooseberries are a gardener’s friend. Even a neglectful gardener with little time or effort to lavish can be assured of a reasonable crop of gooseberries. And, of course, a gooseberry bush will repay more attention with an even better crop of deliciously juicy fruits. 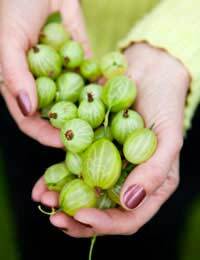 Gooseberries were first grown in the UK in the sixteenth century and soon became a firm favourite with British cooks. So popular were they that in the nineteenth century there were clubs of gooseberry growers who competed against each other to develop tastier and juicier fruits. Many new varieties originated in that time; however in 1905 the whole UK gooseberry crop – and that of Europe – was decimated by mildew. Fortunately, for gooseberry lovers, mildew-resistant plants were re-introduced from America. Today the Egton Bridge Old Gooseberry Society still hosts an annual gooseberry show, which is the highlight of the year for dedicated gooseberry growers. There are many varieties of gooseberries available and they’re not all green. Gooseberries can be yellow, red or white and even black, although black gooseberry bushes are rare these days. They can be hairy or smooth, sweet or sour, soft or crisp and early or late fruiting. The golden dessert varieties can be eaten raw like grapes while the sharpness of the cookers makes wonderful crumble and works equally well as a sauce with oily fish such as mackerel. The varieties Green Gem, Invicta, Lord Derby (red) and Leveller (yellow) all rate highly for flavour. And if you can find it, the old dessert gooseberry, Victoria, is second to none according to gooseberry experts. A gooseberry bush is undemanding. Although it prefers a well-drained loam it will flourish in almost any soil, and doesn’t mind which direction it faces (dessert gooseberry bushes being an exception to this rule as they like a sunny aspect). Mulch annually with manure or a good compost. Prune the main growth shoots of young plants back by half each winter to encourage strong new growth and get rid of branches that are weak or don’t bear fruit. All varieties can be trained into fans or single, double or triple cordons. Gooseberry bushes can be propagated easily from cuttings. Birds, especially bullfinches, blackbirds and robins, love gooseberries. Try creating a flapping screen of strips of plastic as a deterrent or grow the gooseberry bush in a fruit cage. Dessert varieties are particularly appealing to birds so need a good cover. Sawfly, caterpillars and aphids can all be problematic but are easily treated with insecticide. Mildew can also be a problem in branches and leaves farthest from the light. Keep a close check on these and at first sign of affected fruit, remove the damaged berries to prevent the spread. To avoid mildew make sure the air can circulate freely through the branches. If the edges of the leaves appear scorched it may indicate a potash deficiency. Carefully fork in – taking care not to damage the roots - about an ounce of sulphate of potash per grown bush. Wash and pat dry before topping and tailing with sharp scissors (trim off the bits at each end of the fruit). Green cooking gooseberries freeze well. Dessert varieties should be kept in the fridge unwashed until you’re ready to eat them. @skiddy - thanks for your advice, I'm sure our readers will keep this in mind when wondering what to do with their fruit. The Egton Bridge Gooseberry Show remains as the only 'open' show in the country, whilst the 8 - 10 shows in Cheshire remain closed to those which live beyond a certain (short) distance of the village centre. You are right however in stating that the Egton Bridge Show is the 'highlight of the year for dedicated growers'.